Good luck wishes are varied and many – "Have a great day" is even a good luck wish. When was the last time you wished someone good luck? Today? Yesterday, maybe. When a couple gets married, you wish them good luck and happiness. Of course, you know a successful marriage has nothing to do with luck but you say it anyway. Most things in life are not dependent upon luck, but that doesn't stop us from wishing the ones we love all the luck in the world. And strangers. How many times have you wished good luck to someone you just met? For almost any venture anyone we know takes on, our response is to wish them good luck. Why do we do that? We know luck has nothing to do with anything. But, doesn't it? Does luck really not play a big part in everything we do? If luck really has no part in our lives, we would not be constantly wishing everyone we know good luck. But wishing seems to open the doors to all blessings – joy, happiness, success, love, health, peace. And wishing from the heart, from love, is a perfect guarantee that only good will come unto others. There is more to wishing good luck than you can actually put into words. That is why we say just those two words. We can't express what we are really trying to say. When you wish someone good luck you are saying more than just "I hope things turn out for you." You are trying to imply more than what you can actually express with words. Give Good Luck Wishes - They Open Doors to All Blessings! 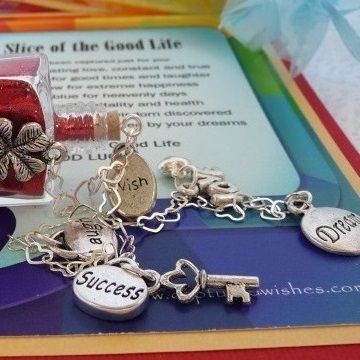 Click the images or links below to see the wonderful Good Luck charms by Captured Wishes. Each one is a complete, ready-to-gift package. That is one of the toughest parts about being human. We can never find the right words. But what if there was a way? What if you could actually turn your wishes into something real and physical? And timely? 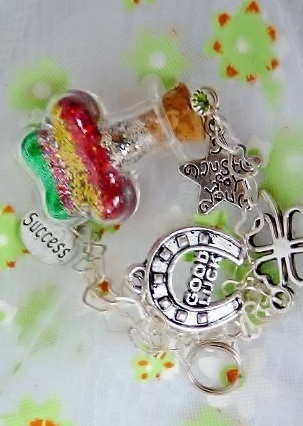 Answer: A super chic and unique Good Luck gift from Captured Wishes. Captured Wishes takes your deep down thoughts and feelings and puts them into a physical form. Each wish is represented by a brilliant color of holographic glitter magically infused with pixie dust. The world is full of color and color is full of symbolism. Happiness, joy, luck, love, etc. Your special someone can be the next to receive captured and carefully packed wishes in a super cute little glass vessel. The special Captured Wishes bottle is mated with a unique verse that explains what the Good Luck gift is all about. 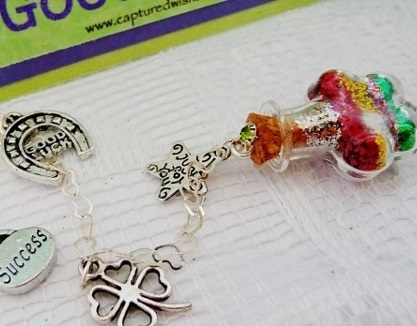 To top it all off, special charms are added to complete the sentiment. What is a Good Luck Wish? It is a simple little bottle filled with everything your heart is feeling. Putting your feelings into words or actions can be extremely difficult. Captured Wishes has mastered this with their unique and chic Captured Wishes gifts. Any occasion, any time of year, Captured Wishes has what you need to tell that someone special exactly what you feel in your heart. The magic dust symbolizing what words can't express is captured in this super-cool little wishing vessel, just waiting for you to open it and make wishes come true. It is truly unique enough to put a smile on any face. Want to wish someone good luck? Why not say it in a way that they will remember for the rest of their lives. Give magical Good Luck Wishes.